Demonstrating the arcane and byzantine processes of cookery has been one of the mainstays of broadcasting since its earliest days. The first definite instance of a cookery programme listed on Genome is in 1924 on 5SC Glasgow, where a Miss Dunnett of the Glasgow and West of Scotland College of Domestic Science gave a talk on the subject in the series Topics for Women. In 1923 Mrs C.S. Peel had given a talk entitled Kitchen Conversation but it is not clear exactly what that was about… All the early cookery programmes were of a similar nature, with speakers, all female, discussing the subject in series such as Women’s Half-Hour from 5NO Newcastle and 5IT Birmingham’s Women’s Corner, and Ada Featherstone giving her Cookery Talk to Women programmes from 6BM Bournemouth. The first mention of a man in relation to cooking is in Children’s Hour from 6FL Sheffield on 15th December 1926, in which one of the 'uncles' was to begin a cookery class. Some of the earliest radio and television personalities were cooks and chefs, from the suave and sophisticated M. Marcel Boulestin, the pre-war French restaurateur who instructed in the mysteries of dishes from 'salade' and 'khebab' to exciting flambéd creations that threatened to set light to your curtains (in a rare holistic approach, he even presented some shows along with the TV gardener C.H. 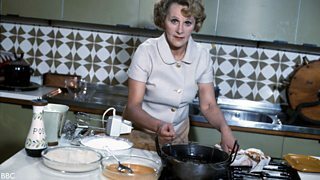 Middleton, to show where the ingredients came from) – to the presenters of post-war cookery shows on radio like Marguerite Patten, who advised on making the most of your rations, then TV chef Philip Harben, the eccentric Fanny Cradock, and through the 70s, 80s and beyond with Delia Smith and the current cornucopia of culinary experts… not forgetting Jimmy Young and his daily recipe on Radio 2. You have to take your hat off to the early TV cooks, who were risking their reputations by trying to make dishes live. Television of course lent itself far more to the demonstration of culinary skills, as radio had to confine itself to the straight talk, with only the fluency of the speaker to excite the appetite. 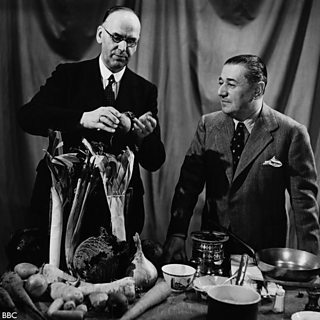 M. Boulestin first broadcast in 1927, giving a talk entitled Wastage in the Kitchen. He is credited with popularising French cuisine in Britain, ran several successful and acclaimed restaurants and wrote several cook books. Tragically, he was in France when that country fell to the Germans in 1940, and died in 1943 before it was liberated. 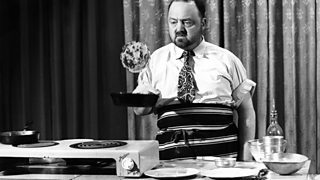 The earliest television cookery programmes included Boulestin’s series Cook’s Night Out which gives a clue as to the income bracket of the first television viewers. There was a simplicity to the recipes attempted, given the time available. Sometimes programmes verged on the bizarre, with a Christmas Day programme on how best to carve your turkey – were people having Christmas dinner in front of the television even then? Every Sunday, Andrew Martin will be guiding you through the history of broadcasting by digging out archive gems and information from the BBC Genome listings.